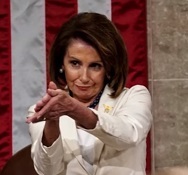 Nancy Pelosi Gives Donald Trump the Clap! Some freshmen Dems in white satirized Trump by chanting USA! USA! –which may be historical as well as hysterical. How often have you seen State of the Union addresses in which members of Congress actively make fun of the president’s speech? As of now I am unable to find a decent clip of that encounter. Note that I interpreted the Femme Dems’ USA! USA! chant as clearly mocking Trump, but he thanked them for it, and some news outlets are treating the incident as if the Dems were sincere. I trust my instincts and don’t buy it.